Around the corner from the Key Food / SuperFresh on Bay Ridge Ave is a Key Food Marketplace that's also owned by the Abed family. (OK, around the corner is a stretch. Around the corner and six blocks south.) This store has been through several banner changes over the years. 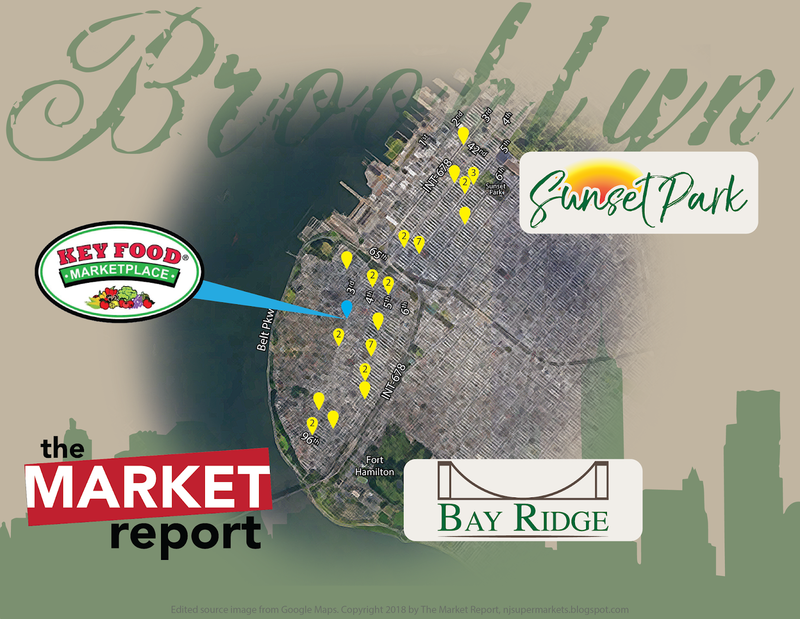 This Key Food Marketplace is at the corner of 3rd Ave and Bay Ridge Parkway (not Avenue), just south of 74th St. Previously Lloyd's Met Foodmarkets, Food City Supermarket, and finally Food Dynasty, this very nice store was under renovation yet again at the time of my visit. 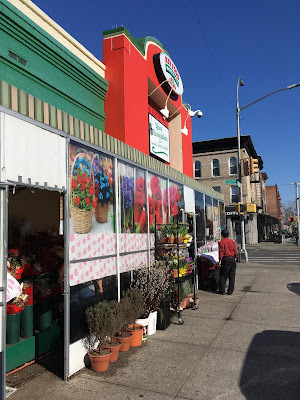 Along the front of the store (here, on 3rd Ave), there is a large fresh produce case, while running along the Bay Ridge Pkwy side of the store is an enormous floral and plants vendor separate from the store. Unfortunately, a lot of the plants were decidedly dead. This covered front section was also, at the time of my visit, being used as a holding area for old ceiling tiles being removed and boxes of new ones waiting to be installed. I'm not sure what exactly those curved lamps are illuminating. I think they're probably just for decoration! Plants and flowers under this awning. Towards the front of the store is a large and healthy-looking floral section. This is run by a separate vendor, since the store does not have a floral department. Let's head in on the front. Produce display along the 3rd Avenue wall. 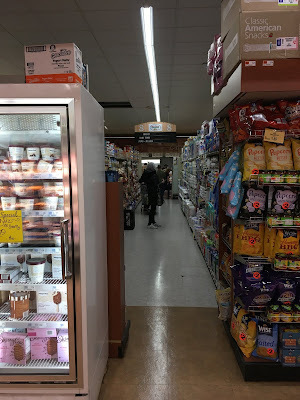 The produce department is first, with meats along the back wall, dairy and frozen at the far end of the store, and deli/bakery along the front end. 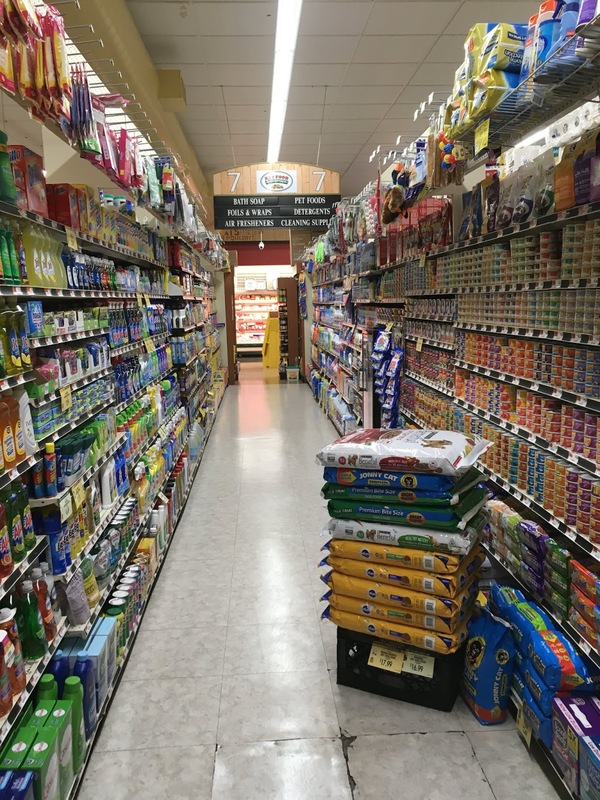 Although the store is very nicely renovated, it's clear it was renovated and then switched to Key Food Marketplace. 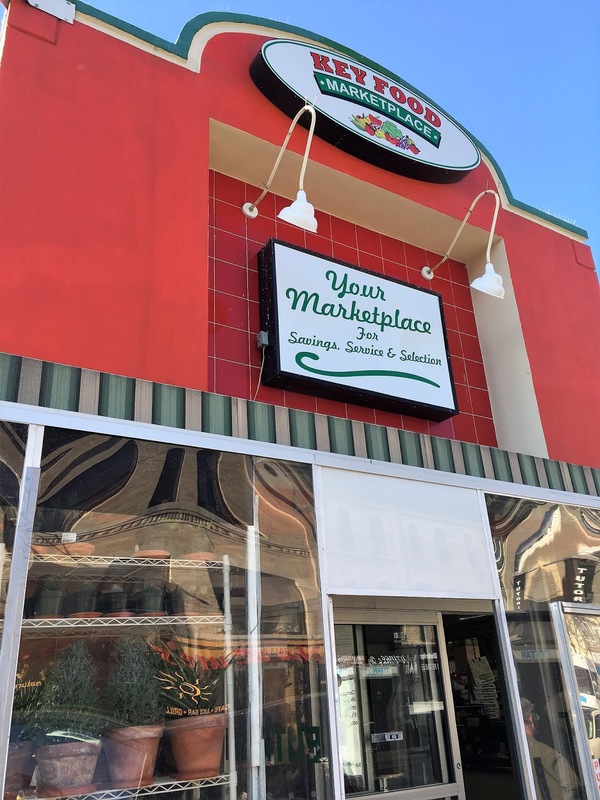 The KFM signage around the store is clearly placed directly over another store's, probably either Food City or Food Dynasty. The produce department is plenty large and well-stocked, although you can tell some of the fixtures are older. 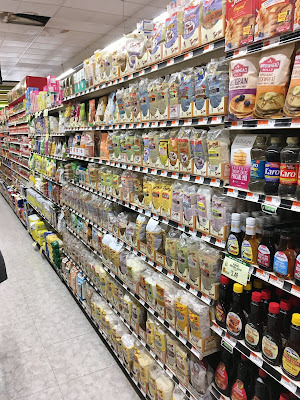 Some grocery items are added at the back of the produce aisle. Although I like the attempt, the Key Food logo printed on these packages is neither the Key Food logo nor the Key Food Marketplace logo. It seems that these owners use the same logo design for their SuperFresh stores as well. Continuing towards the back of the produce aisle, we see that whoever put up this aisle marker was rather ambitious. I really doubt all that is squeezed into this maybe 15', one-sided aisle. A questionably-placed Fresh Produce sign along the back wall of the store. 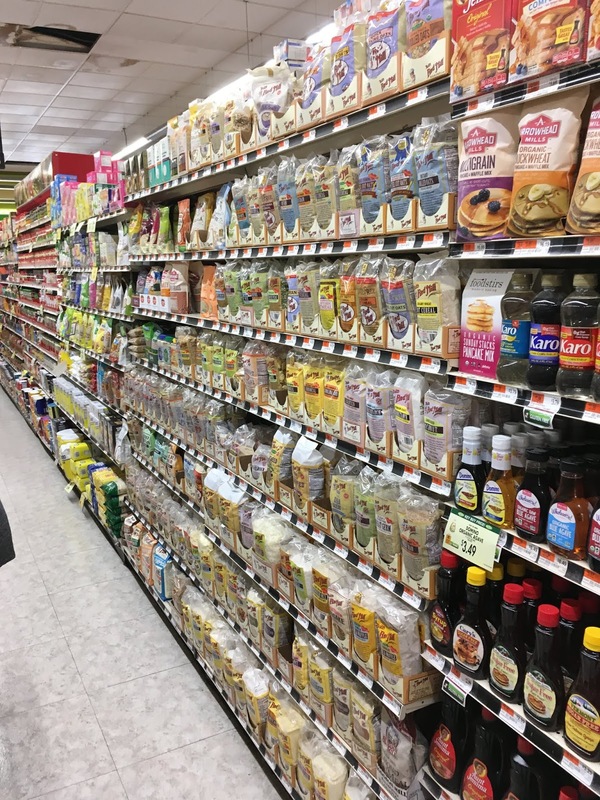 If you go back a few photos, you can see there is already one in the produce department, so perhaps this was from an earlier remodel. Looking back up towards the entrance, we are a little bit bombarded by five Key Food Marketplace logos. It's as though they wanted to be sure that the customers realized the store's branding changed! 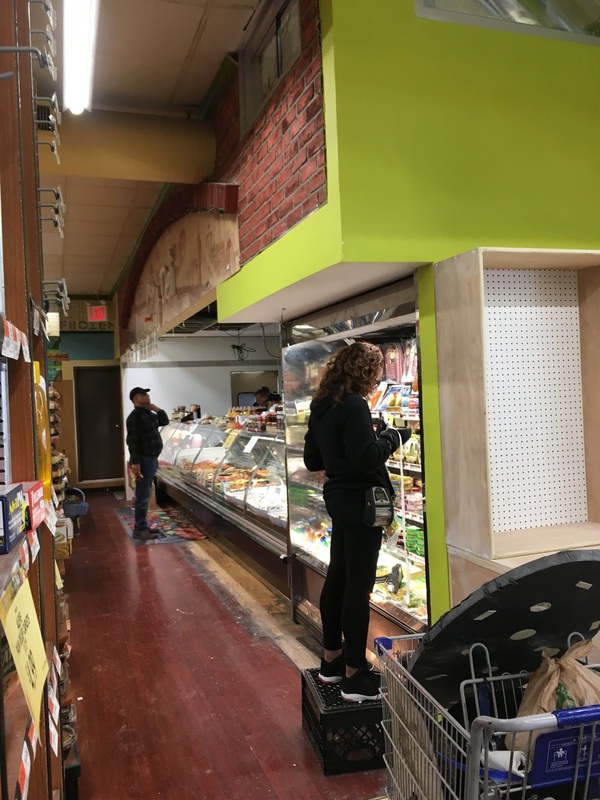 It seems that the store's back wall was pushed even farther back at some point, since you can see the change in flooring. Inconsistencies like this will probably be addressed in a future remodel. In this photo, we can see not only the Key Food Marketplace decal covering the previous banner's logo on the aisle marker, but also that the ceiling is in dire need of replacement. As I mentioned earlier, though, this is in progress. Plenty of Bob's Red Mill selection! Looking along the back wall towards the produce section. Frozen foods and dairy are in the last aisle. Cool graphics that I wish we could see better, but of course the store prefers increased selection! In many urban supermarkets, there isn't a paper goods aisle, but just a lot of paper products on top of other cases. 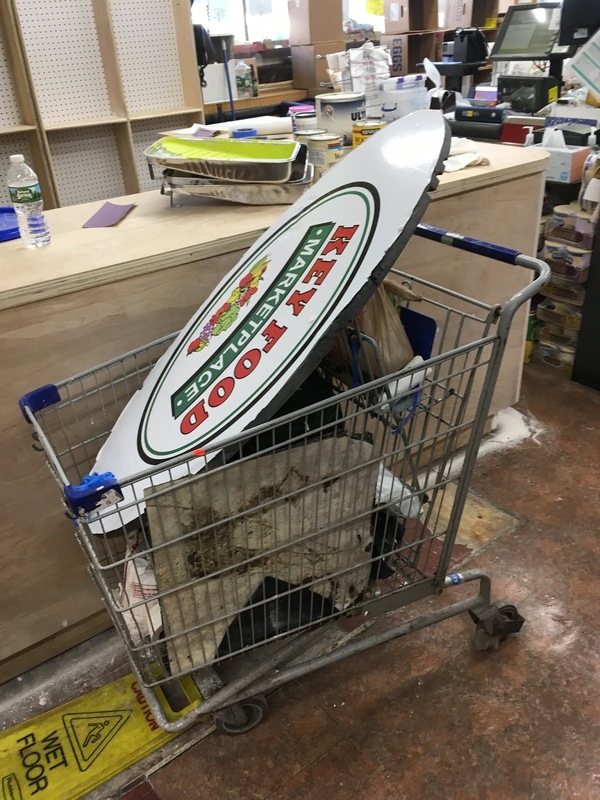 As much as I will joke about it, I was impressed with the fact that serious renovations were going on while the store was still in business. The food was, of course, properly covered. Just next to the deli is an area where a new customer service counter is being installed. It appears that there will also be a HABA selection behind the counter. I don't think the store currently has any significant HABA offerings. Registers continue to the right of this counter. One last look along the front end before we head out. 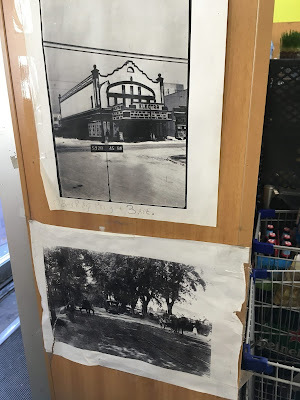 These two pictures were posted at the exit of the store. The top one is, according to the handwritten caption, the corner of Bay Ridge Parkway and 3rd Ave, or where this store now stands. The bottom one does not have any information written, and neither has a year.